Shadow Chancellor John McDonnell this afternoon said gig economy workers will be given the same rights as full employees under a Labour government – a move that would benefit millions of workers in the gig economy and other insecure work who are not currently entitled to sick pay, parental leave, or protections against unfair dismissal. 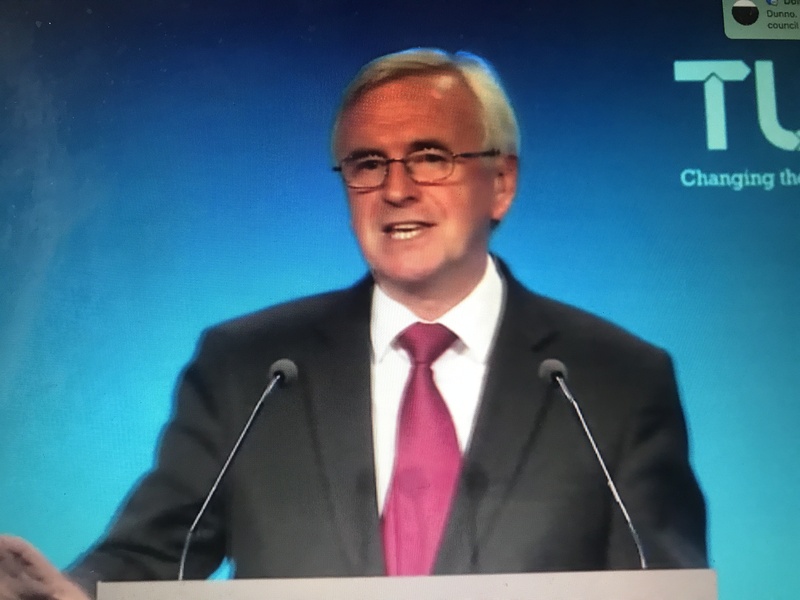 Speaking at TUC Congress in Manchester, he insisted only a Labour government had the understanding and commitment needed to deal with the challenges of the modern labour market. In his speech to the TUC, he said: “The answers to the gig economy won’t be found in the pages of the government’s Taylor Report or in the months of consultation that have followed. Because the report’s starting point is that flexibility must come at the price of insecurity. This is wrong. “Just because you don’t work regular hours doesn’t mean you can afford not to work when you are sick. Just because you work several jobs doesn’t mean you can afford to lose one of them without warning. Just because you value the freedom of independence or the convenience of flexibility doesn’t mean you have to forgo basic rights. “Our manifesto, For the Many not the Few, published a full nine months before Taylor, contains a simple set of policies that would put a complete stop to exploitation in the gig economy. “First, shift the burden of proof, so that the law treats you as a worker unless the employer can prove otherwise. Second, extend full rights to all workers including so-called “limb b” workers entitling everyone in insecure work to sick pay, maternity rights, and the right against unfair dismissal from day one of their employment. “Third, properly resource HMRC and fine employers who break the rules so that people get the rights they are entitled to. It’s not rocket science. “When employers use legal loopholes and weak enforcement to duck their responsibilities close those legal loopholes and strengthen enforcement. When technology creates new employment relations extend regulation to keep pace. And when the balance of power shifts so dramatically away from workers as it has done today it’s time for us to tip it back. “Taken with our commitments to repeal anti-trade union legislation and strengthen trade union rights, to give workers a seat at the Cabinet table by establishing a Ministry of Labour and to roll out sectoral collective bargaining across the economy what we are proposing to amounts to the biggest extension of individual and collective rights our country has ever seen, a plan that will irreversibly transform our workplaces and working lives. And it has trade unions right at its heart.